Description: An eastbound intermodal rolls under the overhead bridge at West Gerlach. Description: A loaded train from Blacksville #2 rolls northward through Rogersville cut with a western visitor on the point. Description: My first picture of a yard slug. 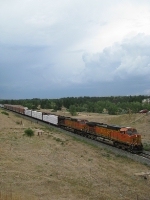 Title: BNSF 5331 leads the SPOPAS West.